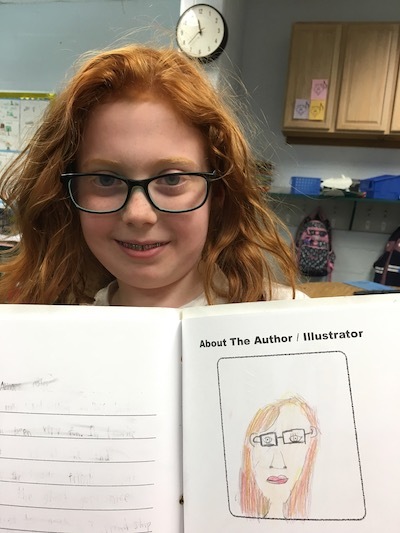 I would love to visit your school to share with the students, teachers and parents my process of creating picture books. 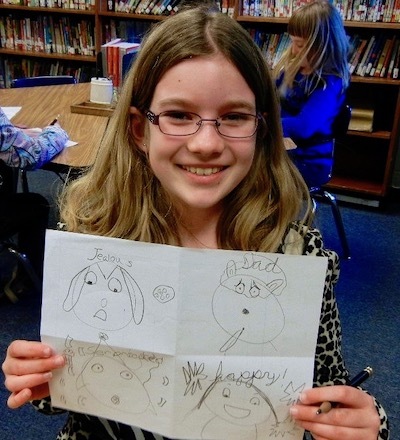 Students will learn firsthand how books are written and illustrated and will be inspired to create their own stories and books! 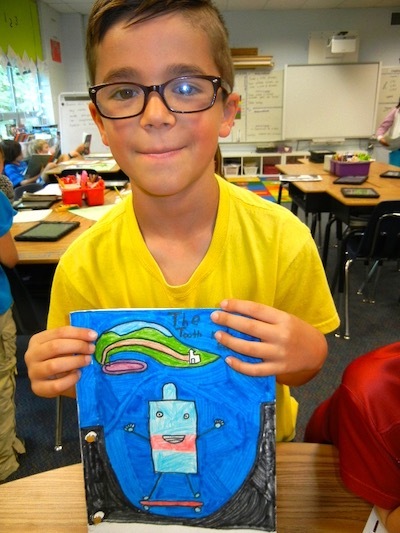 I can also visit your school virtually, from my studio via Zoom. This has been an easy and dynamic way to engage with audiences nationwide. 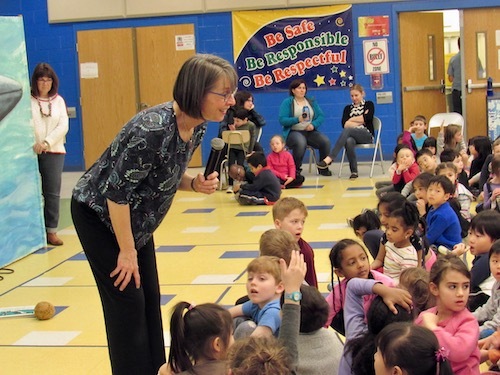 I have visited many elementary and middle schools and enjoy presenting to older students and adults too. Honorarium: For the Washington, DC Metropolitan area - $700 for one presentation, $850 for two and $1,000 for three. 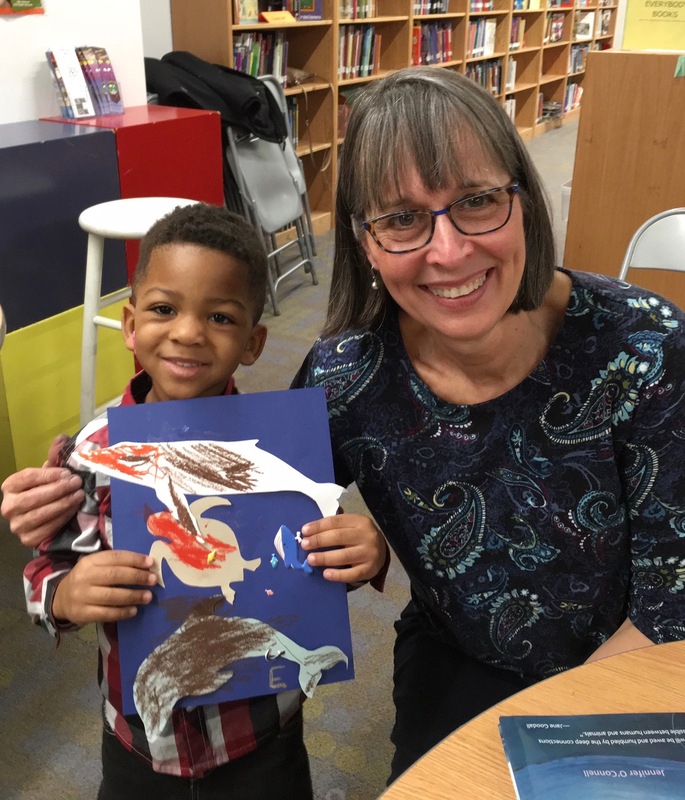 For visits outside the DC area, virtual visits, workshops, artist-in-residence programs and adult groups, please email or call me (301-654-4603) to discuss your needs. I am happy to autograph books. A book sale can help to make the day of the visit even more memorable for the children. There is book ordering information and an order form (click above) that can be customized with your school’s information and copied for distribution to teachers and parents. In this interactive presentation, I share the many steps involved in writing and illustrating The Eye of the Whale. The process included exciting research, interviewing the lead diver of the rescue and motoring out to sea on board the Superfish. I even photographed neighbors posing as crew-members. With PowerPoint slides and props I show the many drafts, storyboards, sketches, dummy books and final paintings that went into the book. I stress how multiple revisions were an integral part of the process. Playing recorded music, I sketch several whales in pastel, which I leave with the group. 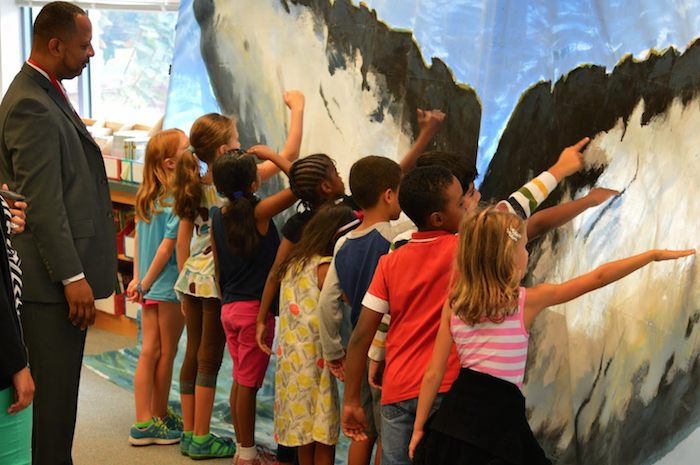 I share fascinating facts about whales and pass around a life-size model “tooth” of a sperm whale. I also unfurl a newborn baby blue whale that is 23-feet long. Before the presentation, I set up a life-size painting of a humpback whale’s tail (that leans against a wall). In this spirited presentation, I discuss the creation of my picture book, Ten Timid Ghosts. Using PowerPoint slides and props, I show my sketches, dummy books, revisions and final illustrations. I demonstrate the color separation process used in printing by showing a set of four, one-color transparencies which, when laid atop one another, magically form a full-color illustration. Toward the end of the presentation, the audience directs me as I draw, and together we create our own unique character. Playing spooky music, I sketch in the setting. Next we all make up a story about our character. 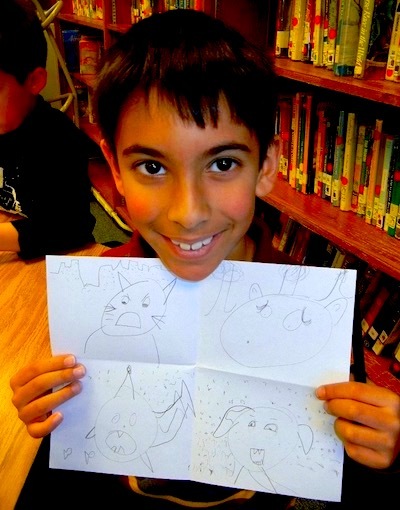 The drawing remains with the class and the children are often inspired to create new tales about him/her! 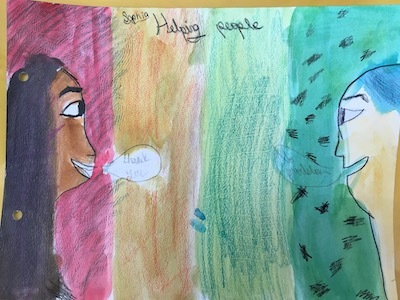 After explaining and showing my process in creating The Eye of the Whale - A Rescue Story, we explore ways that we can be kind and empathetic in our daily lives. I share visuals with ideas of how we can help other people, homeless dogs and cats, bees, birds, marine life and the environment. 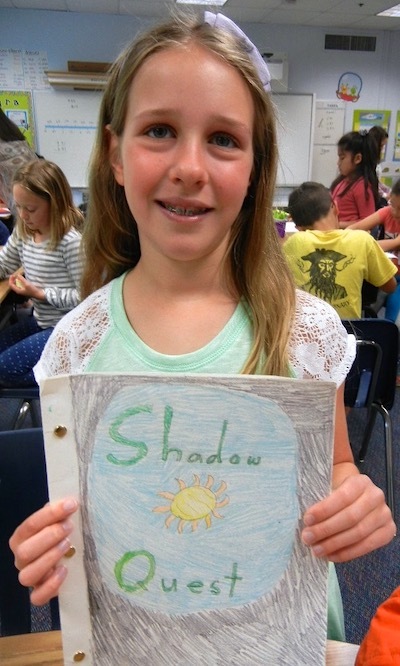 Then each student creates a book with their own illustrations and words about their chosen topic(s). To help when brainstorming, I bring an “idea grab bag” which is a fun way to spark ideas. The workshop can be tailored to the needs and budget of the school. 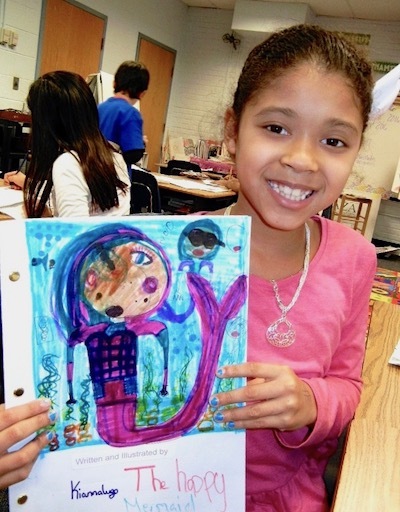 Recently it worked very well as a 5-day residency with the K - 5 students at the Bullis School, Potomac, MD. 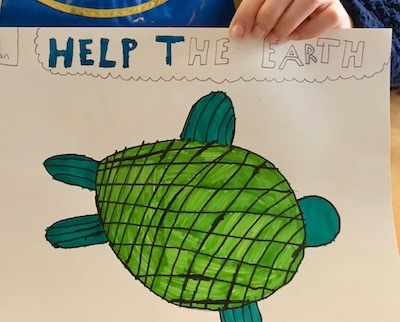 It was very exciting to see the students creating and sharing their illustrations and ideas with their classmates and teachers! 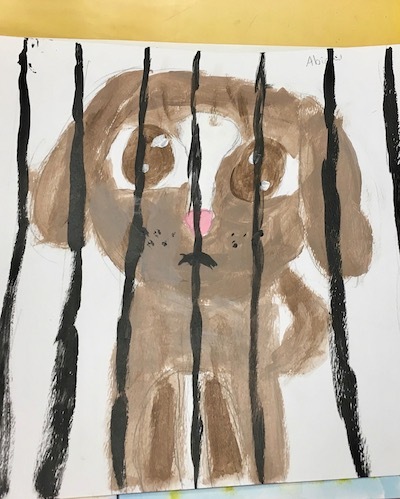 For the last four years I have given a five-day Artist In Residence Program with 6, third grade classes at an Elementary School in Arlington, VA, that includes this workshop. I give the “Eye of the Whale” presentation for all the classes on the first day. On the second day the children start writing their stories with the help of the brainstorming boxes described above. This year they fractured fairy tales. The focus on the third day is editing and revising. 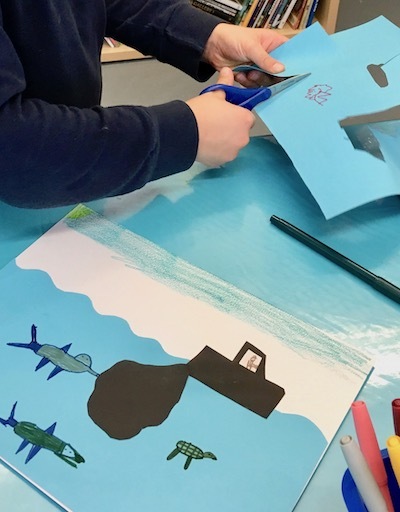 The fourth day is all about illustrating their stories and the fifth day is about cover art and design and learning about the "team" it takes to publish a picture book. I would be happy to discuss a possible workshop or residency for your school or group. I can provide a more detailed outline of the program I’ve been giving and can tailor it to fit the needs of your group. 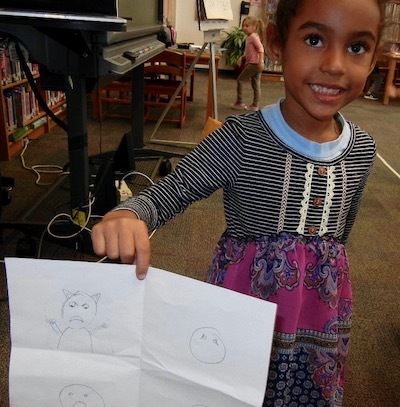 After we all read Ten Timid Ghosts (the audience helps), budding young illustrators will see firsthand how I create my picture book characters. 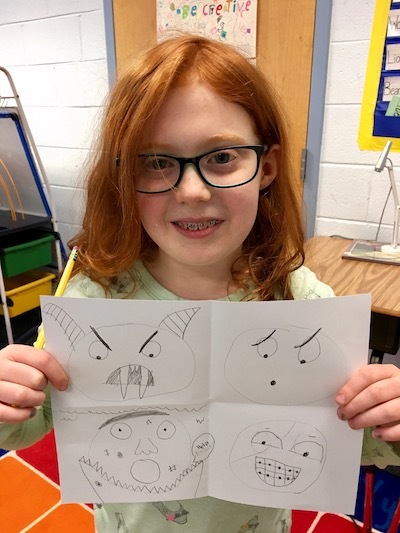 Then participants will be shown, step-by-step, how to draw their own original characters featuring varied emotions and background settings. 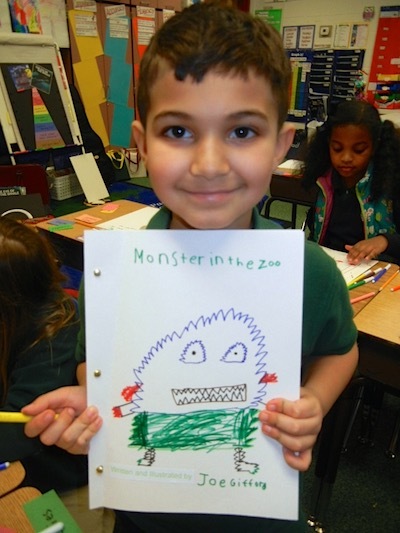 Each child will then put their drawings into their own book, using card stock and colorful pipe cleaners. 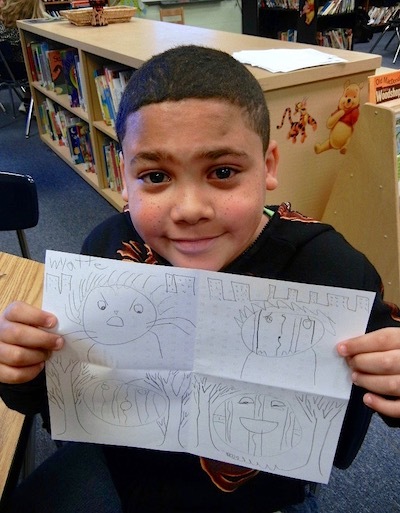 This lively art activity yields successful outcomes for children of all abilities and inspires stories and ideas! It can be a "mini-workshop" that is given right after my presentation depending on the size of the group.